We're proud to announce our new companion subscription system to help teachers and students utilize this site. A teacher can gain use of this system in two ways; by purchasing a teacher subscription which will give you room for 30 students (student upgrades available) or an entire school district can get an account for as many as 20 teachers and 3000 students, with students able to be shared between classrooms. Within a teacher's control is the power to add student accounts, assigning passwords and setting them up for each individual student. You will also be able to manage student grades, as well as activate or deactivate a student's account. Once you setup an account for a student they will be able to browse this site ad free by logging in. 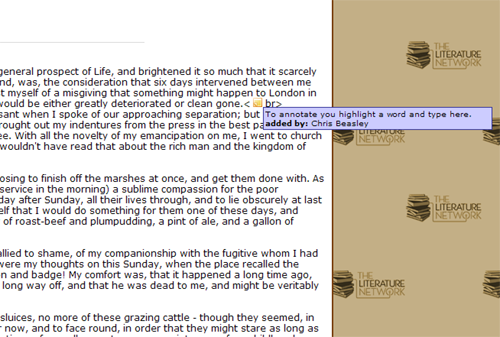 You will be able to directly annotate all of the works on this site. What that means is that you will be able to add little notes, think of them like yellow sticky notes, at any point within the text of our thousands of books, poems, essays, and plays. Then, your students when reading the material will be able to see what notes you have left. 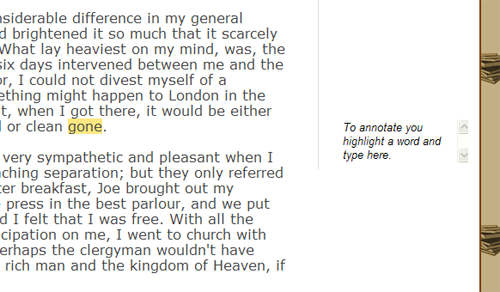 This is an excellent way to provide on the spot additional information or clarification about anything from the text. Screenshot of Teacher View. Screenshot of Student View. You will be able to assign homework of any type and students will be able to upload their work through this site to your account. You will then be able to grade the work and send the student's grades back to their account automatically. You will also be able to create quizzes, share quizzes, and use quizzes shared by other teachers. You can task your students to take certain quizzes and their grades will be automatically calculated. For any student in your class you will be able to pull up their name at any time and receive a listing of their completed assignments, and quizzes, as well as what grades they received. As a teacher you will have a blog that your students will be shown when they log in. This is an excellent way to keep students apprised of new developments and other need to know information about your class. Students will also be able to comment on your blog to provide you with feedback and ask questions. 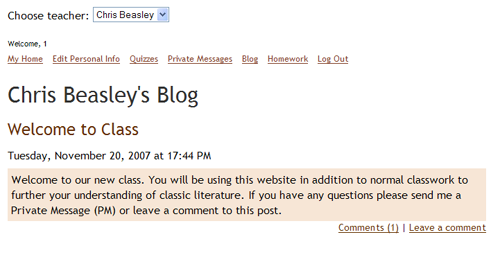 Screenshot of Blog, Student View. Included is a robust private messaging students so students can ask teachers private questions or teachers can give students private advice. Think of it like email, except sent through the site. Try it for a week. If you don't like it, let us know and we'll refund your account fully. Try the system out, you have nothing to lose!